Occupying a prominent spot in Detroit's Palmer Park, the 1885 log cabin designed as a summer retreat by architects George D. Mason and Zachariah Rice for Senator Thomas W. Palmer and his wife Lizzie Merrill Palmer has been closed to the public since 1979. The building has sat boarded up and neglected for decades. With the resurgent interest in Detroit and Palmer Park, the City of Detroit turned to Mark English & Associates to evaluate the structure and make recommendations to stabilize and preserve the structure for future generations. The Phase One work began construction in the Summer of 2016, and includes structural underpinning of the foundations, installing a new cedar shingle roof and gutters, recreating the long-lost front porch, log preservation, and rebuilding of the building's substantially-deteriorated log chimneys. The Palmer Park Log Cabin, as it looked circa 1896. Photograph courtesy of the Burton Historical Collection, Detroit Public Library. The Log Cabin is a Victorian-era balloon-framed structure that is clad in Oak logs with the bark still on. The building also had window awnings made of logs, wooden pole gutters, and a log porch structure complete with built-in benches. The Palmer Park Log Cabin, as seen in 2014. When Mark English & Associates first examined the building, the roof was in an advanced state of disrepair, the building's log porch structure had long ago rotted and had been removed, and the building's log chimneys were allowing weather, rodents, and insects into the structure. In addition, severe structural settlement was observed at all four corners of the building. Mark English & Associates and its structural engineer in examined the building's brick foundations to determine if they were the cause of the structural settlement that was observed, and ultimately discovered that the interior settlement was caused by a flaw in the construction of the building's underlying balloon-framed support structure. The Palmer Park Log Cabin during Phase One of the restoration work, October 2016. The Log Cabin's distinctive log chimney coverings disguise the building's two brick fireplace chimneys from view, giving the illusion of massive, fanciful log chimneys. The structures have already been rebuilt at least once over the course of the building's history, and have suffered tremendous deterioration from water infiltration. The restoration and stabilization efforts will completely deconstruct and rebuild the chimneys to their original configuration using new logs. The original Ford Education Center building, built in 2004 as a generous donation from the Ford Family to the Detroit Zoological Society, brought science, technology and education to this dynamic zoological park. In 2009, Mark English & Associates was commissioned to renovate the auditorium into a state-of-the-art 3D-4D Theatre in a move to bring more realism and full immersion of the senses to the visitors' experience. Our new design for the space included modifications to accommodate new pressure sensitive seating, snow, spray mists, aromas and seat vibrations. Enhanced lighting and speaker systems were also designed to complete the enhanced viewer participation. The new theater attraction made it apparent that a Lobby Expansion would be needed to handle the increased patronage. The Detroit Zoo once again called on Mark English & Associates to expand the existing lobby by 3,000 sq. ft., separate the queues for the Wild Adventure Ride Theater from the Simex Theater, and maintain access to the offices and educational spaces within the building. 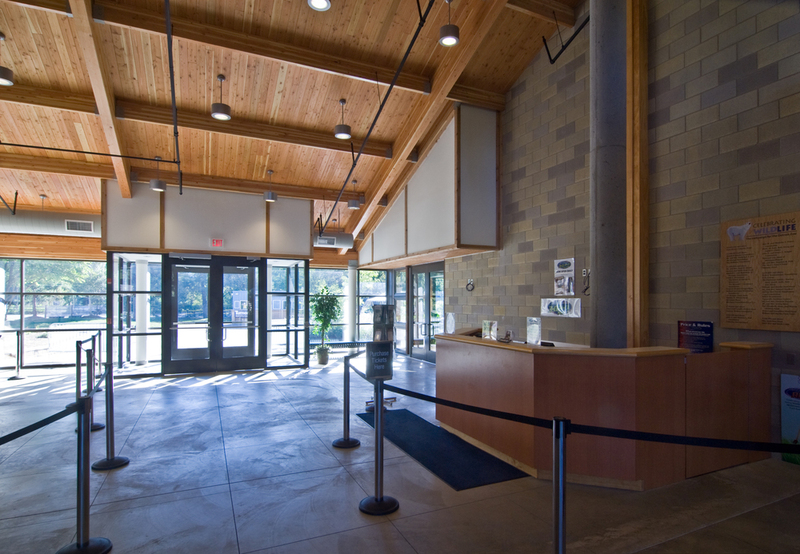 Our design team provided a solution that utilized the same wood and glass materials as the existing lobby, while allowing more interior space for purchasing tickets, improving the queues and maintaining the integrity of the original design and style. View of new Expanded Lobby as you approach the front of the facility. View of Lobby Vestibule and Entrance from the Ticket Counter. Eastward view of the Lobby Vestibule, showing new Ticket Counter and queues. For over 30 years, the Detroit Zoo used a fabric tent, located on the Great Lawn near the main entry gate, for large gatherings, private receptions and events of 300 to 500 persons. An integral part of the of the Zoo’s Master Plan was to complete a permanent structure for corporate events and large social events to provide this highly demanded rental facility. 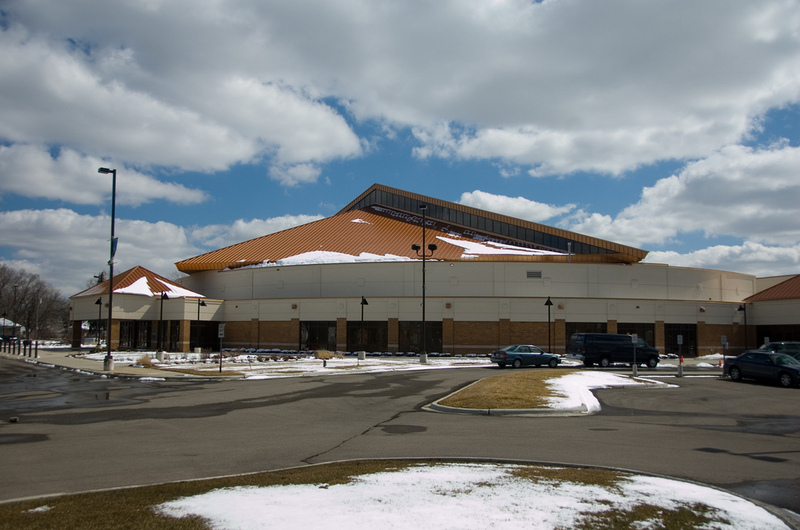 Mark English & Associates provided a solution consisting of a prefabricated steel structure utilizing materials and finishes that complement the neighboring Ford Education Center and achieved a three-season events venue able to seat gatherings of 400 persons comfortably. The final design solution sited the Pavilion in front of the Ford Education Center and connected them with a landscaped plaza and pedestrian oriented walkway. The Ticketing process and Waiting Areas were smoothly integrated into the new layout. The new Events Pavilion features a large open, paved space for seating, dining and dancing out doors. Anchoring the large steel arch bases, the cedar bases provided visual and textural connection to the Ford Educational Center. W-3 Construction, the prime contractor in this design-build effort, tapped Mark English & Associates to serve as the architect for the design of the Chrysler Group's new media production center. The goal of the project was to foster enhanced communication and collaboration between marketing staff with diverse clients, products and delivery schedules. The project converted two former training rooms into a single, 2,300 sq. ft. work room for its social media employees. 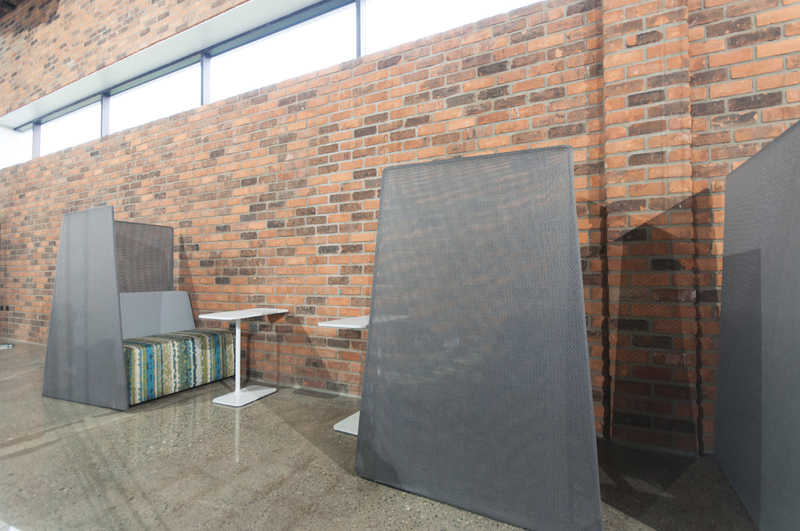 A second phase included the renovation of an adjacent space to a new break room and cafe. The room is designed to evoke the feel of an old loft warehouse, despite being located inside a much newer building. A new brick accent wall, exposed ceiling construction and polished concrete floors all contribute to the client's desired industrial aesthetic. The Media Center features a platform that is used by employees for breakout sessions and small meetings. The platform is clad in clear oak to evoke a look of reclaimed wood. The key feature of the room is an interior brick accent wall constructed of reclaimed common brick. The Wall utilizes both full-sized bricks and thin brick veneer above the windows seamlessly to achieve a cohesive look of and urban setting. 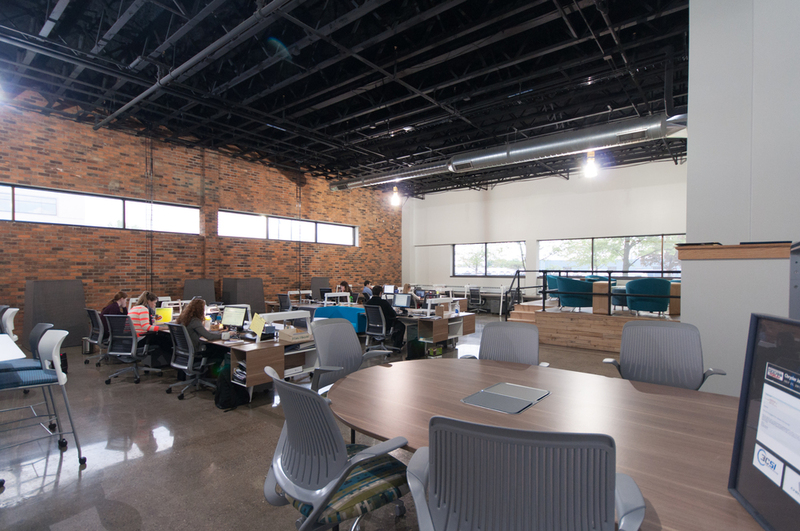 State-of-the-art work stations provide connectivity, privacy and the opportunity for workers to focus on specific tasks without completely isolating themselves from other team members. Fellowship Chapel started out in 1966 with a membership of 175 persons. By 1999, it had grown to over 3,000 members and had become a noteworthy social and religious asset to the city of Detroit and its residents. Its unique ministry stands as a model of the spiritually active and socially committed African-American institution. Under the capable leadership of Reverend Wendell Anthony, the church developed and maintains programs and services that benefit the community, and support the residents of their neighborhood and the city at large. Their mission was to worship, educate the community and support the social and psychological needs of the community. This edifice was envisioned to meet all those diverse needs. The dynamic roof symbolizes the Pyramids and their African-based heritage while the circular shape of the building reflects the embracing of the members and surrounding neighborhoods. The numerous windows and glass openings provide natural lighting, symbolic of a spiritually open mind, body and spirit. And the earth tones are compatible with the brick homes and businesses in the surrounding areas. The large clerestory window accents the roof, admits natural lighting and saves energy. The spacious, covered, main entry is open and inviting while providing shelter from the elements. The canopy allows safe and hospitable gathering before and after services.